I picked a banner day to visit the coast yesterday. The rain was pouring, the winds were gusting, then sprinkle on top a hailstorm and oh yeah, some sunshine... I spent most of my time along the south jetty of the Yaquina River in Newport. It was pouring the entire time I was there, but there were so many awesome birds I did not care. Well, sitting in the car completely soaked from the waist down was a tad uncomfortable. In the grassy/gravelly area along the jetty were the usual gang of gulls, as well as a few Brown Pelicans. Wow, we have not even gotten to the birds actually in the water yet! I saw my first Red Phalaropes under the Yaquina Bridge, near the fishing pier. While I was on the fishing pier, hoping my camera would not blow off into the bay, I looked down and was surprised to find a Pigeon Guillemot below me. Guess it's finally time to invest in that rain suit. I remember a few jetty trips where I was soaked but didn't care because of the awesome Harlequin Ducks on the rocks. I have rain pants, it just didn't occur to me to bring them! I should have known better. I agree, the Harlequins definitely make me forget about the rain. Great trip indeed! That's a great selection of species--beautiful Loons and Grebes iced with a Guillemot. All in the rain? 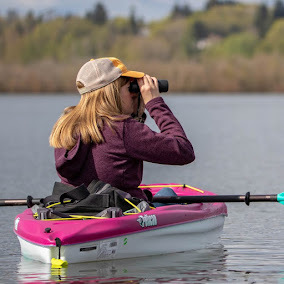 Seems like Oregon birding at its best. It may have been a wet day but what a great day for birding. You even got great shots. I love the Pelican, the Phararope, the grebes and the loons are wonderful. And the Guillemot is awesome, great sightings. Happy Birding. - Dunlin for sure on the piper. - The grebe is obviously in transition from nonbreeding to breeding plumage, but I want to guess Horned. Without being overly experienced with these two in their transitional appearances, this bird seems to be thicker and stouter overall than I would expect Eared to look. Also, from this pic, I can barely detect the bird's red eye, which could suggest that the image and/or bird is so dark that its black-looking neck could actually have rufous tones that we can't detect either. But more than anything, zoom in on the image - is it something on the surface of the water or do I see a white bill tip? On a stout bill, no less. That said, it's probably an Eared :-) Seriously though, I vote Horned. Thanks, Rhett- I'm going with Horned also. Looks like sticking it out in the rain paid off! Looks like your day just kept getting better and better! Love the shot of the gulls hunkered down in the rain! Horned. Congrats on the phalaropes, bummer on the tern. Its a good thing Ive been Ebirding lately as well, I cant wait for them to subtract birds from my life list. Hi Jen. Well I think with a bagful of sightings and images to match it was worth getting wet for. Super post. Ridgefield NWR and other stuff. The magical lands of Troutdale.